I picked up Down and Out in the Magic Kingdom (2003) because it’s set in one of my favorite places in the universe: Walt Disney World. I grew up less than an hour’s drive from the Magic Kingdom, so I’m intimately familiar with the park and, though I’m now middle-aged, I never get tired of visiting. I love the idea of a far-future science fiction story set inside my favorite theme park. Jules is a man who’s over 100 years old but looks to be in his 20s due to rejuvenation techniques and the ability to back yourself up with a clone. In this immortal post-scarcity society, people pretty much do what they want as long as they have enough “whuffie” — a kind of social credit that’s based on their current reputation. Jules (and others of his ilk) live inside Disney World and operate the same rides that have always been there. Jules’ territory (which actually belongs to his girlfriend) is in Liberty Square, where the Hall of Presidents and the Haunted Mansion are. A woman named Deborah has possession of other rides in the park such as Pirates of the Caribbean. When Jules is shot and killed in the park, Deborah’s clan makes a play for the Hall of Presidents, and by the time Jules is back in his new body, they’ve taken over and begun modernizing the ride with virtual reality techniques. This offends Jules’ sensibilities (he’s a Disney purist), so he plans to sabotage their new ride while also hatching a scheme to protect the Haunted Mansion from suffering the same fate. As Jules becomes more and more manic about his projects, his personal relationships begin to deteriorate. As expected, I loved the setting of this story, though I thought it was interesting that Cory Doctorow chose to feature the Hall of Presidents, a ride which, in my opinion, is old-fashioned and extremely dull. It’s possible he thought this would work best with his VR plot, but it’s also possible that he loved (as I do) the juxtaposition of such an outdated and passé ride with this far-future postmodern science fiction story. 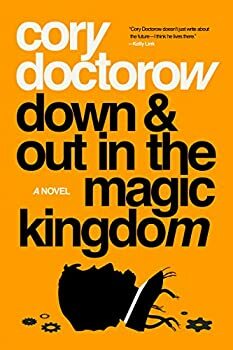 I did not love Doctorow’s characters — not a single one — so it was hard to feel much empathy for any of them. Jules seems awfully immature for someone who’s lived over 100 years and has multiple doctorate degrees. The concern over changing Disney World rides seems petty and it’s hard to get excited about such a plot, but maybe that’s not really the point of the story. I listened to the Recorded Books audio version of Down and Out in the Magic Kingdom. It’s narrated by Doctorow himself. The audio production is not great — I could hear Doctorow turning the pages and once I even heard a siren in the background. Also, he repeatedly mispronounces “Kissimmee,” a city outside Orlando. Doctorow isn’t an actor and doesn’t perform this as well as a professional would, but I do enjoy hearing an author read their own work. I found this recording at my library but I don’t see it at Amazon or Audible, so I guess Recorded Books agrees that it’s not a very good production. Doctorow is known for giving away his work for free, so I suspect you could legally find this recording online somewhere for free. Down and Out in the Magic Kingdom — (2003) Publisher: On The Skids In The Transhuman Future. Jules is a young man barely a century old. He’s lived long enough to see the cure for death and the end of scarcity, to learn ten languages and compose three symphonies…and to realize his boyhood dream of taking up residence in Disney World. Disney World! The greatest artistic achievement of the long-ago twentieth century. Now in the keeping of a network of “ad-hocs” who keep the classic attractions running as they always have, enhanced with only the smallest high-tech touches. Now, though, the “ad hocs” are under attack. A new group has taken over the Hall of the Presidents, and is replacing its venerable audioanimatronics with new, immersive direct-to-brain interfaces that give guests the illusion of being Washington, Lincoln, and all the others. For Jules, this is an attack on the artistic purity of Disney World itself. Worse: it appears this new group has had Jules killed. This upsets him. (It’s only his fourth death and revival, after all.) Now it’s war….